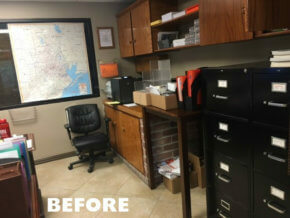 BRI Office Renovation - Brick Restoration, Inc.
It’s a new year and a new look for Brick Restoration. 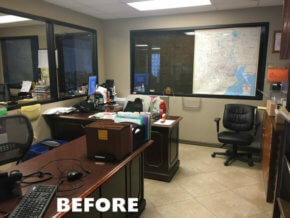 We’re happy to announce that the business has been growing and as a result, our office required a bit of a face lift to accommodate our expanding personnel. We want to share with you some of these exciting changes and invite you to come by to take a look, chat, and let us serve you with excellent customer service (and an excellent cup of hot coffee). We contracted Jose Alberto Estrada with Arista Jr. Design & Remodeling for the renovation. Before, our office was closed off, cold, and uninviting. Our employees were hidden behind their walls and their computers and there was a lack of communication flow throughout the office. After, Our office is bright and open! 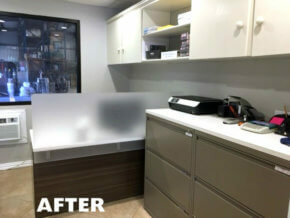 The walls between the offices and reception area were knocked down and recessed lighting was installed throughout. We also swapped our boring beige walls for a clean gray look. Now our receptionist, Nicole, is ready to greet you as soon as you walk in! The next item on our list was to address our actual work stations. We had bulky traditional wood desks that were way to cumbersome for our space and crowded even the user. 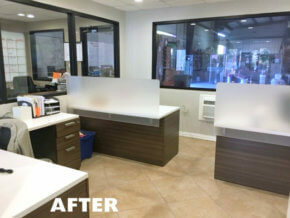 We contracted Furniture Marketing Group (FMG) to provide us with new desks and filing cabinets for our office. They were fantastic in guiding us with what would fit to best utilize our space and executed our exact vision! As in every office, the kitchen is a place for congregation. 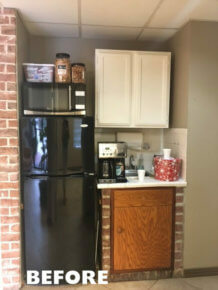 Before, ours was far too cramped for the amount of people in the office, even our coffee pot didn’t fit properly. 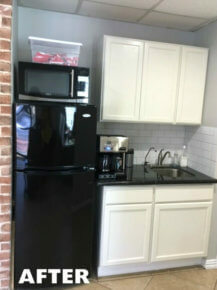 With a little expansion, we were able to add enough space for extra cabinets and a larger counter and sink.. We got rid of the tiled counter top and put in black granite and white subway tile for the back splash. Lastly, we wanted to give the office a special touch. We decided to put our emblem on the wall to instill a sense of pride in our employees and for those that come visit. 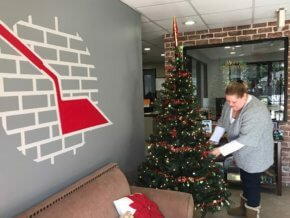 Here is our Customer Service Specialist, Sheila, putting up our red tree for the holiday season. Overall we are thrilled with the final look for our office! We have already noticed an improvement in employee morale and know that this translates over to better customer service and greater customer satisfaction. We look forward to a fun and successful 2017!